Meet the little leaders. They're brave. They're bold. They changed the world. Featuring the true stories of 40 inspirational women creators - from writers to inventors, artists to scientists - this book is as inspirational as it is educational. Readers will meet trailblazing wome... read full description below. Meet the little leaders. They're brave. They're bold. They changed the world. Featuring the true stories of 40 inspirational women creators - from writers to inventors, artists to scientists - this book is as inspirational as it is educational. 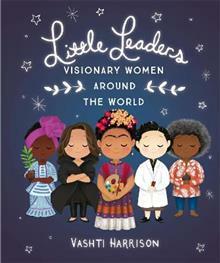 Readers will meet trailblazing women such as revolutionary architect, Zaha Hadid, actor/inventor Hedy Lamarr, environmental activist Wangari Maathai, modernist painter and animator Mary Blair and physicist Chien-Shiung Wu. Some names will be familiar, some will not - but all these women had a lasting impact on their fields.